LEWISVILLE, Texas, October 4, 2018 – Spanning 39 stories and more than 500,000 total square feet, the new West Edge Tower in downtown Seattle has already become an iconic architectural feature in the city’s celebrated skyline. The tower relies on a highly efficient mix of cladding materials, including curtain wall, glass, masonry and high-performance insulated metal panels by Metl-Span. 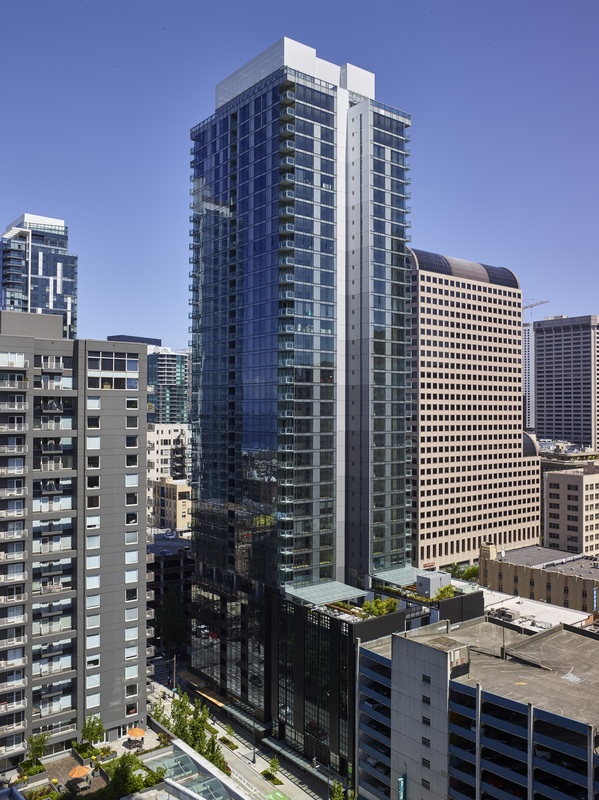 Located at 2nd and Pike Street, the luxury high-rise sits squarely between Seattle’s thriving retail and financial cores, a strategic location to attract residents for its more than 300 available units. The mixed-use development was designed to reflect the city’s urban core and the surrounding architecture, while paying tribute to the natural landscape of America’s Northwest. The unique design, labeled “sophisticated casual” by the building owner, takes into account the latest in sustainable innovations while providing high-end amenities to its clients, including a premium gym, a Sky Bar restaurant and unobstructed water and city views from resident balconies. “We wanted to cater to the urban resident that wants a little more space and fresh air, pairing this prime location with an ideal space,” says Greg Smith, CEO of Urban Visions. For residents, access to nature and open space starts on the ground floor with a seven-story atrium occupied by a live Tsuma Gaki maple tree. On the building’s exterior, the inspired use of curtain wall and glass provides a shifting reflection of the sky. The use of insulated metal panels also served as a key design element, according to installer McKinstry Co., LLC. “The multi-colored, metal exterior was a feature created by the design team to make the wall look as though it faded into the air,” explained Project Manager Peter Avratin with McKinstry. Olson Kundig Architects specified more than 38,000 square feet of vertical Metl-Span CF Architectural insulated metal panels in 13 different hues, ranging from dark Obsidian to luminous Off White with multiple shades of gray in between. 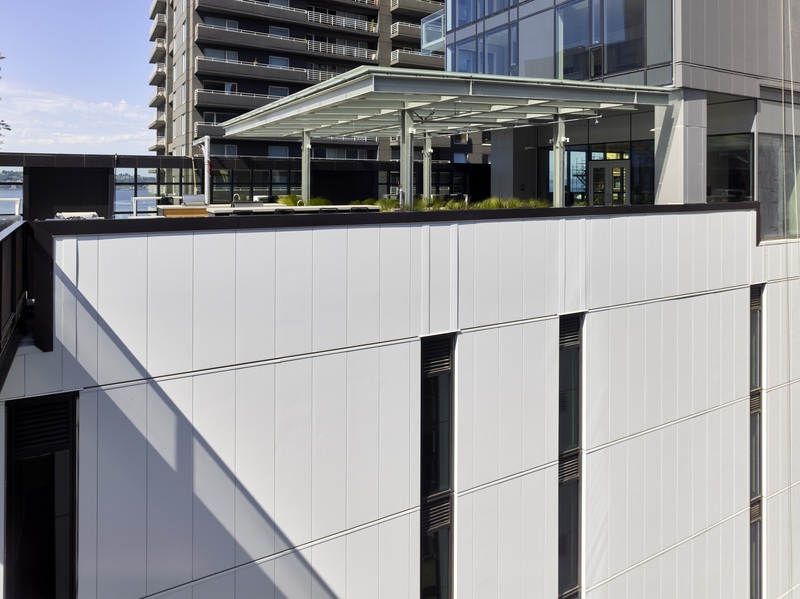 CF Architectural panels offer a smooth, flat profile that is ideally suited for designers seeking a monolithic architectural façade without sacrificing thermal and moisture performance. The flush panels have become a mainstay in several high-end architectural markets including the multi-residential and hospitality industries. Metl-Span CF Architectural insulated metal panels provide exceptional thermal performance in the form of polyurethane foam insulation. The designers at Olson Kundig Architects specified the insulated metal panel system in a 2-inch thickness, delivering an R-value of 14.95. 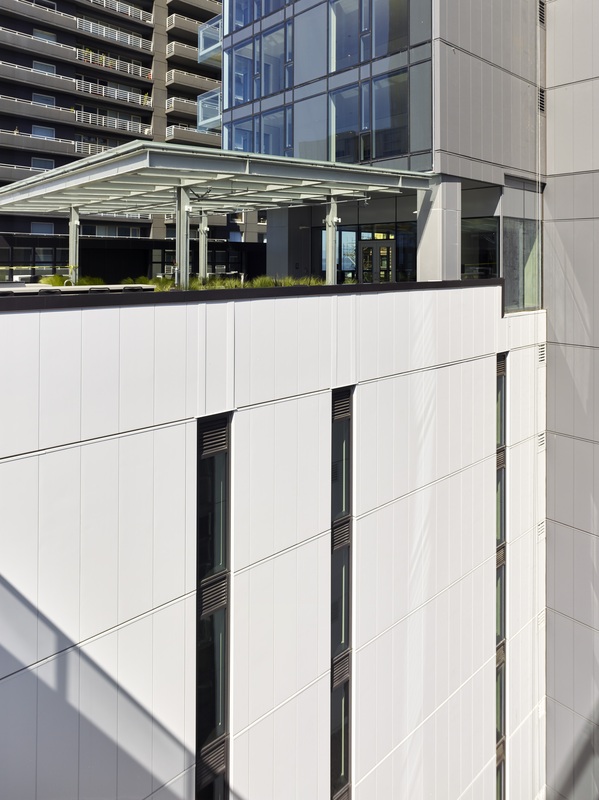 CF Architectural panels are available in thicknesses up to 4 inches to tailor thermal performance to meet even the most demanding building requirements. Insulated metal panels provide thermal efficiency and all-weather control in a single component. 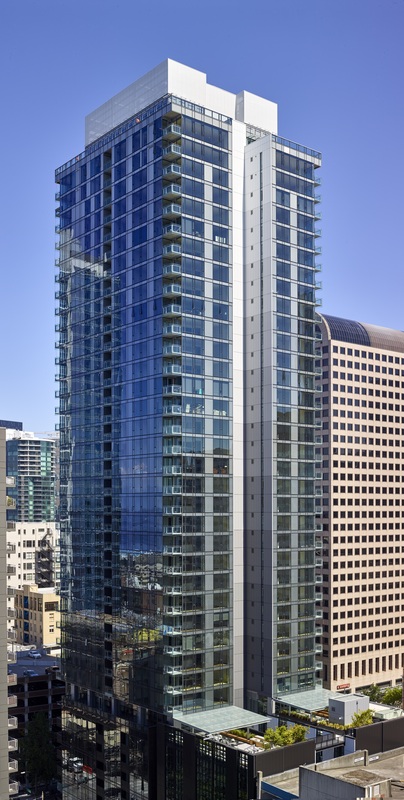 The highly efficient insulation contributes to West Edge Tower’s top-notch energy efficiency by reducing HVAC costs. The system delivers an added advantage by minimizing installation time and effort. According to Avratin, speed of construction was a vital element to the West Edge Tower project. “Building a high-rise tower that rented faster than the multitude of other towers going up in the city was a major goal,” Avratin noted. With reservations starting as early as January, West Edge Tower opened the doors to potential clients in March 2018. The project is slated for LEED® Gold certification, exceeding Seattle’s high standards for sustainable construction.